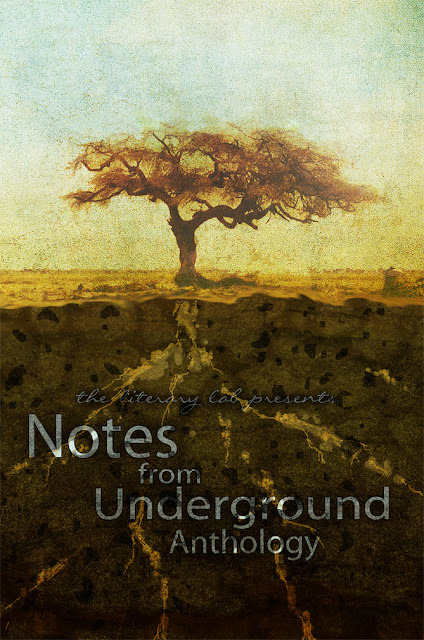 I've finished reading the Literary Lab's Notes from Underground Anthology! Have you read it yet? The text is a little gritty throughout, as can be expected from a book that was entirely unedited. There are typos, goofs, and happily flagrant abuses of good taste. (I won't promise I was above it...) But that was the point. It was a very fun experiment in complete author freedom, and there are some gems rattling around in this delightful junk drawer of talent. 1. Of course, I think MY story is worth reading. "Notes from an Enchanted Castle" is a smutty set of letters passed among the disgruntled servants in the Beast's castle (as in, Beauty and the Beast). Click here for a sneak peek. 2. In case you die before you read the whole book, start with "Terminal Instar" by C. N. Nevets. It's just plain good storytelling with plenty of suspense and energy building over a few short pages in an everyday setting. 3. Then check out Lisa M. Shafer's "Voices from the Sidelines." It's a collection of inside jokes for the well-read--pretty much the most highbrow fanfic ever. The short pieces are well executed and clever. 4. The narrator of B. A. McMillan's "The Making of a Witch" has a cool, lyrical voice. 5. The last line of J. B. Chicoine's "Four Words" sticks the landing just right. 6. Loren Eaton's "Apocalypse Closet" has a very funny--well, maybe NOT so funny in light of recent current events that occurred after publication--premise. 7. A line from Yvonne Osborne's "Maybe" jumped out at me, for personal reasons: "Something else for them to carry." in reference to a homosexuality gene that women supposedly carry. 'Cause babies and the blame for original sin aren't enough, I guess. 8. There are not one, but TWO references to Edith Piaf's version of the song "Non, je ne regrette rien," in Anne R. Allen's "The Golden Age" and in Susannah E. Pabot's "Trees Without Trunks." How appropriate in a collection of deliberately unjudged and unedited pieces. All proceeds of the Literary Lab's anthologies go to charity. I'm still getting through it, I have read a couple stories, one was of course my own because it is way different to see it in print and the second story I read was C.N- which was really good. I'm looking forward to reading yours and the rest of them. Loved your story too, m'dear. 'Twas wondrously amusing! My copy will probably have to wait until my semester ends....vacation reading here I come! Love, love, love your story! I haven't read them all, but I'm enjoying every one. Thanks for the mention. I regret nothing. Summer and Simon, I jumped ahead to your stories when I read the book! You two never fail to entertain. Amen, Anne. Your reference inspired me to rent a movie about Edith Piaf. That, too, was a great story. I love the entire book. It's absolutely wonderful, and it was a joy to put together. I am so honored and lucky to be a part of it with all of the amazing authors. Thank you so much for this post! I love what you say: "A delightful junk drawer of talent." I am so impressed with this Anthology (not just because I snuck in). It's such a privilege to be amongst so many writes whose work I admire. Thank you for all your work on this book, Michelle! It was a fun collaboration. JB, welcome to the Nutshell! I enjoyed your story. It reminded me of case studies in developmental and abnormal psych classes in college. Oh, my! Then I sure hope I portrayed Selective Mutism accurately! Thanks for your kind words, Genie! I already mentioned I loved yours when I sneaked a read during copy-editing, but I'll be posting up some further comments like you did soon. Jeannie, I love the phrase "junk drawer of talent." That's fantastic. It's really cool to see which stories you like. Thanks for talking about them!